A timely cross-community and cross-border youth drama production of a new play SL&NCR: an entertainment that goes A-Z but not in that order! written by the Fermanagh-based playwright Carlo Gébler is being performed at The Glens Centre, Manorhamilton and the Ardhowen Theatre, Enniskillen on March 30thand 31st2019 respectively. The play features a large ensemble cast of thirty-two young people from across the community of Fermanagh and Leitrim and has is the culmination of a ten months creative cross border collaboration process, developed as a part of the Across the Lines, International Fund for Ireland programme running out of The Glens Centre. 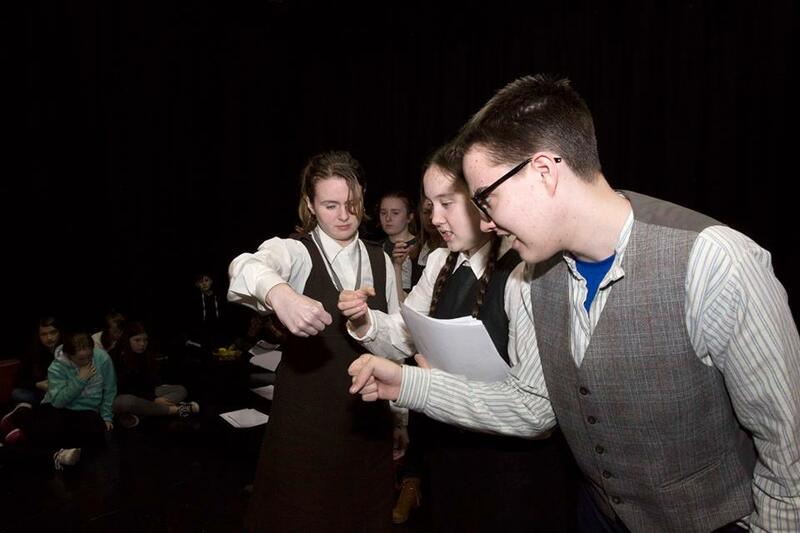 The project commenced in June 2018 with young people coming together with their drama Leaders Declan Drohan, Sally Rees and Tori Lee and the playwright Carlo Gébler to research the Sligo Leitirm and Northern Counties Railway which once connected people, townlands and communities between Enniskillen and Sligo. Young people undertook a series of informative site visits to the Enniskillen Railway Museum, and the former stations of Florencecourt, Belcoo and Glenfarne talking with a number of local historians and railway enthusiasts. As an inter-genational project, working with the Ballagh RISE project and individuals, stories were gathered from those willingly to share memories of bygone days of the railway. 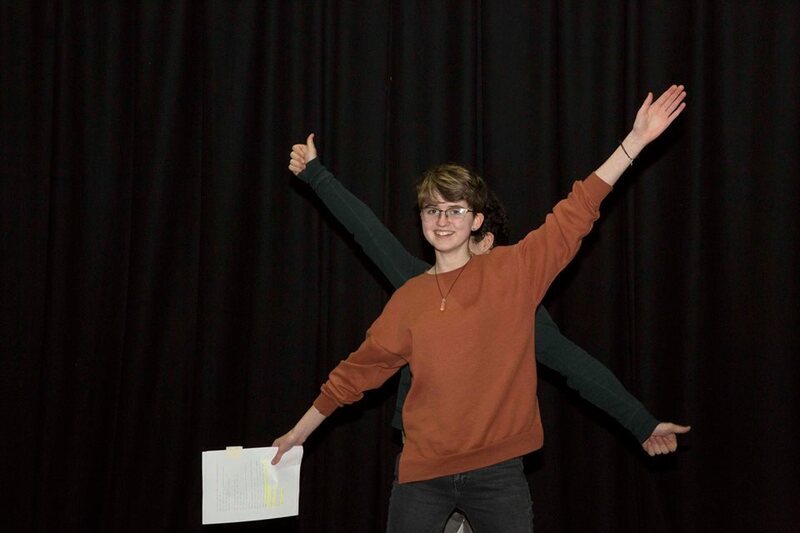 As Declan Drohan, Director with Manorhamilton’s Senior Youth Theatre stated: “the project has involved a unique mining of local lore and family stories in relation to the psychic space occupied by the old railway line”. Declan goes on to outlines something of what audiences coming to the play can expect: “a playful act of ensemble storytelling and an emotional and rigorous act of time-travel”. Starting out, participating young people shared with each other how often they crossed from north to south or vice versa. Typically, Leitrim young people went North ‘frequently’ for shopping in Enniskillen, with Fermanagh based young people coming south ‘regularily’ to visit friends. In an organised ‘walk in a border landscape’ exercise led by the Leitirm artist Séamas Dunbar, young people as a cross community and cross border group of young people had the opportunity to experience ‘the invisible border’ up close for themselves, together. The story gathering has all fed into and was the catalyst for a powerful script, by Carlo Gébler, which has been directed by the drama tutors Declan Drohan, Tori Lee and Sally Rees with support from Treason Nealon and executive artistic directorial guidance provided by Kabosh’s Artistic Director Paula McFetridge. For Paula McFetridge, “facilitating artistic cross border collaboration and allowing for vital conversations about the positive role theatre can play in archiving trans-generational stories that celebrate the past and allow us to imagine new possibilities for a collective future has made this an exciting process and is all the more importance given the uncertainities around Brexit”. The IFI Project Coordinator and production producer Ruth Gonsalves Moore affirms that “the result is a timely, energetic youth production that educates, inspires and moves” and she concludes that “the ten month experience has been a positive and empowering one for young people; they have had opportunities to get to know each other, as friends and peers and hopefully this work will have the chance to progress and deepen in the near future”. The Glens Centre’s Across the Lines IFI programme supports community cohesion and peace-building in north Leitrim, with its neighbours in Fermanagh and the border region. This youth drama project is one of six projects seeking to create new opportunities to bring people toegther working through arts and creativity to harness skills and enable new understandings. The Glens Centre wishes to thank the International Fund for Irelandfor their support, and the Leitrim Youth Theatre Company, and especially the Enniskillen Railway Museum, Rossinver Thursday Feel Good Club, Belcoo Friday Fun Club, Ballagh Centre RISE project, the individual local historians, youth and adult interviewers and interviewees who shared memories, and to all the participating young people, their parents and leaders who committed themselves to the project, taking time to travel between Manorhamilton and Enniskillen on a regular basis to make the project happen. See the show in The Glens Centre on the 30th of March and in the Ardowen, Enniskillen on the 31st March. Next postOn this day – cross border collaboration and creativity in action!